We’ve selected what we feel are the key examples of Ghent Building Developments, Belgium. We aim to include projects that are either of top quality or interesting, or ideally both. We cover completed Gent buildings, new building designs, architectural exhibitions and architecture competitions across the city area. The focus is on contemporary Ghent buildings but information on traditional buildings is also welcome. 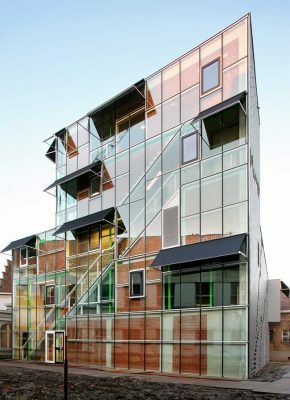 We have 1 page of Gent Architecture selections with links to many individual project pages. 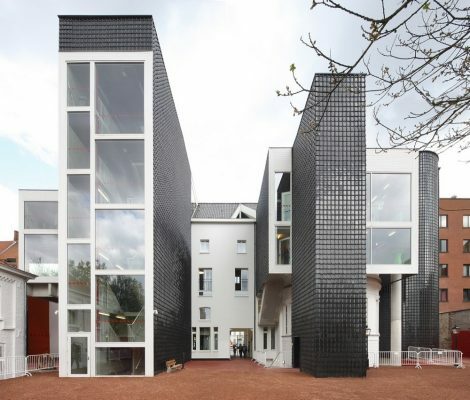 A grand, nineteenth century façade, a structure of ‘stacked tables’ and a leitmotif of shining, black volumes form together the new social services centre in Ledeberg. The new centre will house the ViAA (Flemish Institute for Archive of the audio-visual heritage), Luisterpunt – a library for blind people, i-Cubes – a centre for starting ICT – firms and, a new medium – size rock concert hall that will be constructed under the main atrium space. The renovation of the building is part of the transformation of the Waalse Krook-neighbourhood in the centre of Ghent together with the new library and living lab for new media that is already under construction. At the Bijloke site in Ghent, Jan De Vylder architecten constructed a production house for dance company Les Ballets C de la B and musical theatre LOD. The result is two alienating constructions back to back; as if they have been pushed apart, yet still contemplate one another through unusual viewing holes. At first, the architects were asked to design a single building with six theatre venues. After reconsidering the entire project, they ended up with three buildings with one theatre venue each. At this moment, two have been built, and the third building obtained a new function as foyer. The two main aims in the design for the Urban Library of the Future and Centre for New Media in Gent are to create a dynamic, flexible and open knowledge environment, whilst simultaneously strengthening the character of the location with the introduction of a building with a distinct architectural identity.